Our business is based in Hale'iwa on O'ahu's iconic North Shore; however, we offer services on all the Hawaiian Islands, and even around the world! Our most popular package includes 10 hours of coverage with two photographers, and costs $2,600. 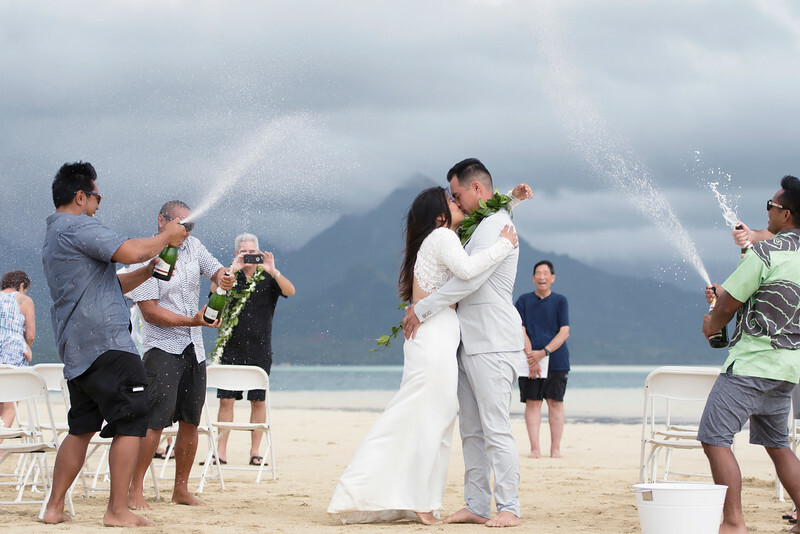 We specialize in intimate destination weddings and offer the best rates for high quality wedding and vow renewal photography in Hawaii. Packages include a fast 1 week turnaround time, digitally enhanced photos, a private web gallery of images to share with family and friends, and professional print ordering. We look forward to helping you document this very special day. Our full wedding packages start at $1800 for a full day, but because every couple is different, we can create a custom package that is right for you. We also offer beach packages. Please send a brief message with details on your special day for wedding prices and we will get back to you shortly! We also offer mini engagement sessions and trash the dress sessions at a heavily discounted rate if you book your wedding with us. All our packages are customizable to your needs, and we offer competitive pricing that will fit most budgets. Our wedding photography approach is subtle, unobtrusive and personable. We process our images which results in elegant and natural photos that capture moments important to you. Our goal is to make you smile every step of the way! Please note that our 2018 & 2019 season is filling up quickly, so be sure to get in touch soon to book your wedding package today. Our full wedding packages start at $1800 for a full day, but because every couple is different, we can create a custom package that is right for you. We also offer beach elopement and vow renewal packages. Please send a brief message with details on your special day for wedding prices and we will get back to you shortly!